Colder temps often lead to dry indoor air, and with dry air often comes dry skin and chapped lips. 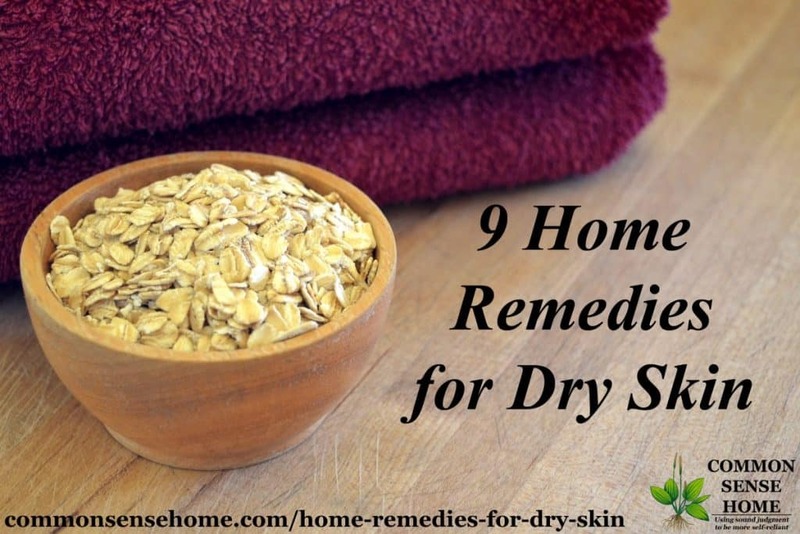 I've pulled together 9 home remedies for dry skin, along with tips for avoiding dry skin year round. From coconut oil to backyard weeds, we'll help relieve winter dry skin and eczema and sooth itching and cracking. Coconut oil is a much loved moisturizer for many. It may work best when applied at bedtime and allowed to soak in overnight. Eating it may be even more helpful. My personal favorite is Nutiva coconut oil, which tastes like fresh coconut. Some people do find coconut oil to be comedogenic (pore clogging) – others do not. (I use it daily and do not have any problems.) 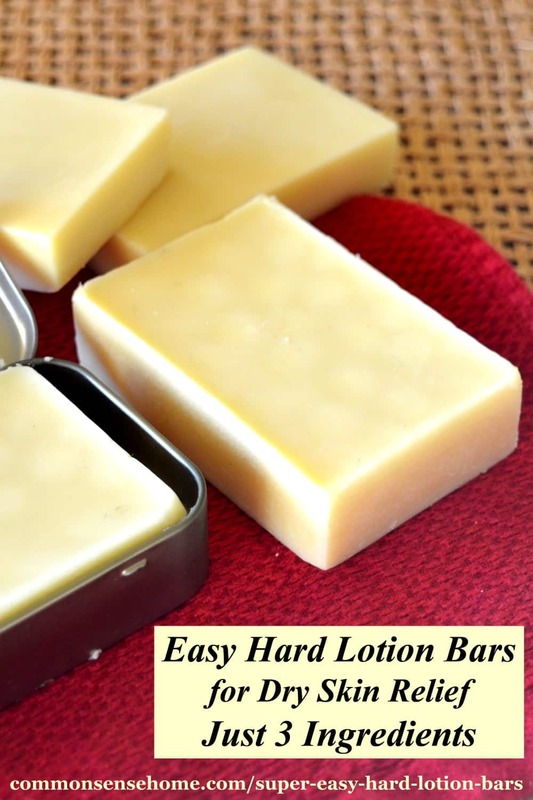 Some find that it wears off too quickly, which is why I like to use option #2 – hard lotion bars. A couple of times per year, I mix up a batch of hard lotion bars. Hard lotion bars are a moisturizer that is hard at room temperature, but melts when it is warmed by your body heat. To use, you simply hold the bar in your hands to warm it, or rub against the area that the want to treat. These bars have a great shelf life and don't require refrigeration like some homemade creams and lotions. They're also great to slip into a baggie and pop into your purse, because they won't spring a leak like a lotion bottle might. Birch tea is recommend in Backyard Medicine for the relief of skin conditions such as eczema and herpes. The tea may be made using fresh or dry birch leaves. To make the tea, cover four of five birch leaves with one cup of boiling water. Steep for five to ten minutes. For eczema, drink one cup of tea three to four times per day and apply the tea as a compress to the affected area. To make a compress, dip a soft cloth into the warm or cooled (not boiling) tea and apply to the skin. America's most hated lawn weed is like a mini-pharmacy in flower form. 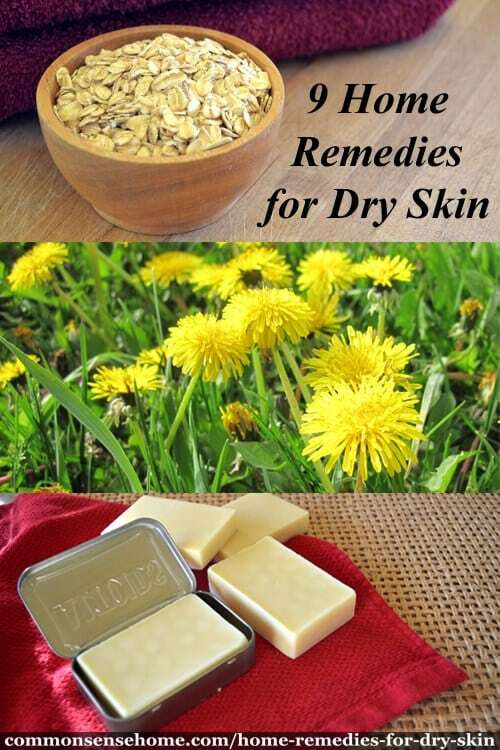 Dandelion leaf is suggested for an herbal bath in the book Dandelion Medicine. The author states that this bath is good for eczema and dry, oil, or itchy skin. As a detoxifying agent, it may also by helpful to those who are trying to lose weight and those with yeast or fungal infections. Simply bring your water to a boil, then pour it over your leaves. Cover (to contain volatile compounds) and let steep for 30 minutes. Strain out the leaves and add the tea to a warm (not hot) bath. Soak until the bath cools, or as long as you like. If you don't have dandelion leaf available, you can purchase it online via Starwest Botanicals or through other herbal sources. There are several different options for using the soothing, nourishing powers of Avena sativa (oats) to your bath. You can buy a premade product like Aveeno Soothing Bath Treatment or soap. You can bundle up a handful oatmeal in a mesh bag and hang it in the stream of your bath water water (add some chamomile for extra soothing). Squeeze the bag gently to release even more of the soothing oat milk. Another option is to finely grind your oatmeal in a blender or food processor and sprinkle directly into the bath water. Oatmeal may also be combined with milk (2 cups per bath) or baking soda (1 cup per bath). Place the dried herbs in a double layer of cheesecloth or mesh bag and place in the bathtub while it is filling. Comfrey and marshmallow help soften dry skin, while rose petals and chamomile sooth and add a lovely fragrance. This simple 4 ingredient body cream goes together in a flash in the food processor and keeps for around 6 months in the fridge. Store in a dark glass jar. Makes about 4 ounces. Grass fed beef tallow is high in micronutrients that nourish skin, and can be made into a silky skin cream when combined with olive oil and a skin soothing essential oil. Check out the post “Nourishing Tallow Balm” on GNOWFGLINS for the recipe and instructions. Two users on Earth Clinic recommend glycerin for dry skin. One applies it mixed half and half with water, the other applies it full strength. They suggest applying at bedtime and letting it soak in overnight. Drink Plenty of Liquid – avoid sugary sodas, juices and caffeine, which may make skin conditions worse. Look to water, herbal teas, and water kefir for hydration. Infuse some fruit or add a splash of citrus or a sprig of mint to make plain water more appealing. Eat Healthy Fats – Fats are essential for our health and well-being. They help hold moisture in our skin, keeping it supple and soft. Choose your fats wisely. Avoid damaged fats such as hydrogenated oils, interesterified fats, and liquid vegetable oils such as corn, soy and canola (most of these are chemically processed and genetically modified). Look for fats that are naturally solid at room temperature for cooking, such as butter, coconut oil, sustainably harvested palm oil, lard, tallow and poultry fat. for non-heated applications, use extra virgin olive oil, or flaxseed or walnut oil. Keep the flaxseed and walnut oils in the fridge, as they will go rancid quickly. Fish oil and cod liver oil are also good. Keep Warm, Not Hot – Hot showers, although they may feel great, will dry out winter skin even more. Stick to warm or cool water. Wash Less and Use Gentler Cleaners – I'm not talking about going completely “campy”, but consider showering less frequently and only using soap on the stinky spots. I'm guessing that most of us do not have elbows that require a heavy duty soapy scrubbing. Opt for milder soaps and cleansers. Soap acts as a surfactant, breaking up and washing away dirt, grime and oils – including our natural skin oils. Many cleansers/soaps on the market are also filled with a cocktail of chemical fragrances and other questionable ingredients. Keep it simple and keep it as natural as possible. You may even want to consider going “no poo” or making your own soap. I hope you find this post useful. Please Pin, Share, Stumble or otherwise pass this post along if you like it. Happy readers are our best advertising! You may also enjoy the other posts in our Home Remedies Series. I would hesitate to use Glycerin in a dry climate….Glycerin binds moisture and if it can’t get it from the air it will take it from your skin. It is a great moisturizer in damp climates but not dry ones. Thanks for the note, Trudy. Thank you. So helpful and look forward to more good reading. I’ve started using pure almond oil as a moisturizer. I use it in the baths for children, thus avoiding the need for lotions afterwards, as well as on my skin. It is a great moisturizer that sinks in quickly. I am surprised not to see it here – your thoughts? I don’t see a problem with it, other than if you use quite a bit of it it may start building up on your drain pipes, and could make the tub floor slippery. Thanks for sharing. I used to only have very dry skin in the winter months and then in the summer my face etc would turn oily. But for the past couple years my face/head/etc stays severely dry – to the point of flaking and itchy/red n scaly”. I’m thinking that some of my meds. are the culprit(s) but I consume plenty of water. As I most generally have a 64 ounce mug of ice water with me at all times. **In fact, a doctor that I had a few years ago told me that I was drinking too much water and could get ”water toxicity”. I kept drinking my water anyhow – I just happen to love ice-water ! I’ve used just about every lotion out there for extremely dry skin and started using coconut oil on my face/neck/around my ears etc. nightly. I don’t take hot showers and never more showers than absolutely necessary either. My current doctor doesn’t seem too concerned about it but then he doesn’t have to deal with the excessively dry skin on a daily basis though, either. I’m quite ‘health oriented’ and was well into “living green” long before most others. I adore being able to eat my “weeds” and try to discover more n more daily – that are edible and/or medicinal. Any other help you can give me … is greatly appreciated. I check your Face Book page, daily. What’s your diet like? Do you get plenty of high quality fats? How about probiotics? I’ve started used Probium probiotics recently, and have been happy with them. Those would be some of the first areas I would look into. Also, your ice water habit might be a part of the problem. Traditional Chinese Medicine and Ayurvedic principles both say that regular consumption of cold liquids and foods is bad for health. Check out Cold Foods and Cold Drinks Caused Health Problems and Why Cold Water Is Bad For You . Years ago I read that chapped, cracked lips are a sign of leaky gut!! If your gut isn’t working correctly, I would think that nutrient absorption would be an issue, leading to nutrient deficiencies. Hi Laurie. (re good newz letter 22 April) I like the fact that you are trying to live of the grid where possible, and tips/hints and other information is great. I take out what info is relevant to me in New Zealand (so funny thou as i get your winter info in summer) & my today is your tomorrow :-). I have made 2 small batches of the ‘Hard lotion Bar”, 1 batch i used ‘shea butter’ with some Manuka Oil (Tee Tree oil like substance). I gave away my 1st batch made with cacoa butter as not a fan of chocolate, now have also gifted to friends the balance of my shea butter. I am going to make some more small batches soon & will experiment with adding other complimentary oils. I am an active relaxer, so always doing something. Hi Leigh-Ann. Thanks for sharing your experience. Your comment about not being a fan of chocolate reminds me of my husband’s grandmother. She was an avid chocolate lover. Many years ago we were at a family birthday party, and my SIL introduced her new fiance to grandma. Grandma, being sociable, invited him to have a piece of the birthday cake. He declined, saying that he wasn’t a fan of chocolate. Grandma was quite taken aback, and stated that she had never heard of someone who didn’t like chocolate. Makes me chuckle every time I think of it. warning if you have had your gallbladder removed and are still unable to eat ” fats”. Putting olive oil on your skin will cause havoc on your system.